I use Kindle as my main database for any books, articles or whatever I'd like to read. I try to push anything (pdfs, notes from meetings etc) to my Kindle so I'm always sure that nothing stays unread (that's a part of my GTD approach). But also I use Evernote for storing all my knowledge, experiences, "to-read"'s etc. It's basically huge database of everything / anything I'd like to preserve. Using Evernote you'll surely hit the https://evernote.com/webclipper/. It's a browser plugin which main job is to save particular pages in Evernote. 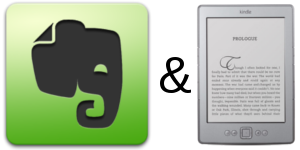 So howto Kindle & Evernote? I searched for a way to basically send any page directly from Evernote Web Clipper to my Kindle (for future reading). And this time I didn't want to create my own solution (which would be probably easy to implement: connect via https://dev.evernote.com/doc/, fetch any new notes marked for Kindle use (e.g. by tags), send to Kindle e-mail address). So I found http://en2kindle.com. It's very simple tool - just authorize it to read your notes within Evernote and then authorize it to be a legit sender to your Kindle mailbox. Now just decide wheter you'd like to have all notes from particular notebook sent to your Kindle or rather only those notes tagged with some particular tag. Enjoy and support en2kindle - it's ony $6/year! Oh one more thing for people concerning about security. It simple as that - it's as secure as keeping data in Evernote. It's internet - deal with it.